What is Microneedling Radiofrequency ( MNRF) ? Microneedling Radiofrequency (MNRF) is a minimally invasive technique which uses radio-frequency energy to remodel scars, finelines, wrinkles,stretch marks by inducing collagen. How does Microneedling Radiofrequency ( MNRF) work ? Rf microneedling uses very tiny microneedles (smaller than the diameter of a hair) to deliver safe radio frequency energy into the deeper layer of the skin (mid-dermis) thru’ miniscule beams causing “fractional heat zones” leaving normal tissues in between the heat zones for faster recovery. This induces collagen in 2 ways – 1. The microneedles cause microinjuries and the body heals by collagen production. 2. The radiofrequency energy is delivered 360 degree at the end of the needle tip, furthering collagen synthesis and tightening. Because the energy is delivered at the depth of the needle, there is almost no to minimal injury at the skin surface (unlike lasers) causing minimum downtime. This is as similar to rebuilding a cracked foundation in a house, allowing all of the layers above that foundation to be stronger, stabilized, and in their proper place. Our MNRF offers several settings for depth, intensity, and number of microneedles, which allows treatments to be customized as per the individual. The process is gentle and has very little downtime. What are the common applications of Microneedling Radiofrequency ( MNRF) ? What happens during a Microneedling Radiofrequency ( MNRF) procedure ? A numbing cream is applied half hour to 45 mins before the procedure. After that, depending on the indication, the MNRF settings are adjusted and the energy is delivered to the target area which generally takes 10 t0 20 minutes. The patient is given a list of post care and next follow up date is set. Does Microneedling Radiofrequency ( MNRF) hurt? Because the numbing cream is applied, the procedure is generally well tolerated. What are the after effects of Microneedling Radiofrequency ( MNRF)? Microneedling can cause swelling and redness, which is normal and will subside within a day or two. Ice application helps. Scabbing may or may not be seen after a procedure depending on the intensity of settings. The scabs may take 3 to 7 days to fall off. One may use make-up to conceal the scabs. What post care is to be followed after Microneedling Radiofrequency ( MNRF)? Strict sunprotection is recommended after Microneedling Radiofrequency ( MNRF) procedure. Avoid stepping out in the sun for 48 hours. Exposure to beach, swimming pool and waterparks are to be avoided in the initial week to 10 days after a laser (even with sunscreen usage). 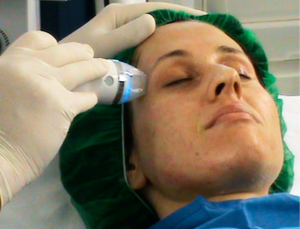 Facials, bleach, peels, microdermabrasions, Clean-ups are to be avoided for 10 days after laser. If you are using a medicated cream containing tretinoin, hydroquinone, salicylic acid, benzoyl peroxide etc., they should be withheld for 5 to 7 days as per your doctor’s instructions. When will I start to see results from a Microneedling Radiofrequency ( MNRF) treatment? That generally depends on the indication of treatment. Epidermal resurfacing for an even texture shows results as early as 2 weeks after the procedure. Finelines and wrinkles show results after 3 to 4 sessions of MNRF. Acne scars improve after 6 to 8 sessions. Stretch marks take a longer time, 8 to 10 sessions for improvement. Again this depends on indication. Generally, patients require 3-4 treatment sessions that are spaced one month apart in order to give the skin time to fully rejuvenate and rebuild its foundational matrix, restoring the skin’s texture and strength. Scars and stretchmarks need more number of sessions. Who should not undergo an Microneedling Radiofrequency ( MNRF) procedure ? Patients with keloidal tendency, active infections, actinic keratosis, history of herpes infections, atopic dermatitis should avoid MNRF. Is Microneedling Radiofrequency ( MNRF) safe for my skin tone or type? The beauty of Microneedling Radiofrequency ( MNRF) is that the technology is colorblind. This makes Microneedling Radiofrequency ( MNRF)a better alternative than laser skin resurfacing for the majority of patients with dark skin or skin which is prone to scarring or pigmentation. This also means those with lighter skin tones no longer have to post-pone laser therapies during the summer – fractional radiofrequency doesn’t have to wait for your tan to fade. How is Microneedling Radiofrequency ( MNRF) different from fractional ablative lasers like CO2 laser ? Minimized damage to the skin surface: unlike laser skin resurfacing, fractional radio frequency is able to deliver the energy where it’s needed most, in the lower dermis, while minimizing the damage to the skin’s surface. This means you will experience the absolute minimum downtime, without sacrificing results.